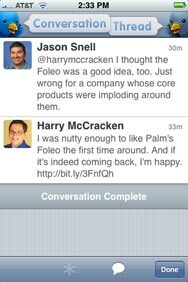 Twitterrific's new action bar lets you view author information, follow conversations, and more. Being first out the door can be good. 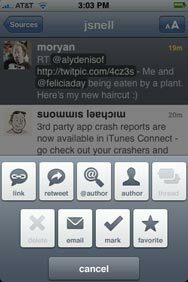 Twitterrific was probably the first Twitter client on the Mac, a version of it appeared on the iPhone early on in the pre-App Store jailbreak era, and when Apple flipped the switch on the App Store last July, Twitterrific was there, too. 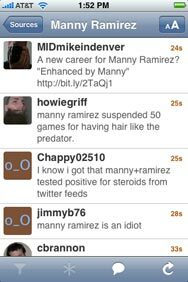 The first version of Twitterrific was obsessively focused on streamlining the reading experience. That philosophy still underlies this version, but layered on top are a zillion and one new features that exploit the growth of Twitter and the increasing power of the system app developers use to connect with Twitter. The filter button lets you limit your timeline to mentions, direct messages, and other message types. The app’s tweet-reading view looks pretty much the same as in the previous version, with the exception of a new toolbar on top (which allows you to toggle between large, medium, and brand-new teensy type display modes, as well as open the new Sources screen). The big change is on the bottom: Tap on the new filter menu (the icon looks like a funnel when it's inactive), and you can filter your timeline, focusing on just replies, direct messages, favorites, messages you’ve sent, and messages you’ve marked for later use. Touch the new action menu (it’s an asterisk icon), and instead you’re provided with options to make a new tweet with a link to the tweet you’ve selected, “retweet” the content of the tweet in a new message (with two configurable options for the format you use to retweet), view the author’s timeline, view the author’s user information, view the entire conversation of which the tweet is a part, delete the tweet [if it’s yours], e-mail the tweet to a friend, mark it for later use, or set it as a favorite. You can also act directly on items within tweets. If someone references a user’s @account, when you tap on that name Twitterrific will display a screen with access to that user’s information, timeline, and even your favorites for that user. You can also follow, unfollow, or block a user from that screen. When you tap on a #hashtag, you’ll see the latest posts featuring that hashtag on Twitter in a native Twitterrific interface, not via Twitter’s web version, as in previous versions. It's easy to follow a threaded conversation in Twitterrific 2. To speed things along, you can even set up tappable shortcuts for some of these features. I configured my app to show the user information screen when I tap on a user’s avatar, to display the entire threaded conversation connected to the tweet when I double-tap on that tweet, and to set the tweet as a favorite when I triple-tap on it. If you tap on a Web link from within the list of tweets, Twitterrific will display it in a built-in web browser, as in the previous version. The big improvement here is the addition of built-in support for Instapaper, Marco Arment’s excellent app for saving items to read at a later time. This is one of my favorite features in Tweetie and other iPhone twitter apps, and it’s nice to see it come to Twitterrific. Sadly, one of my favorite features of Twitterrific 1.0—one that turned out to be unique among Twitter apps—has vanished in this version. It used to be that when you replied to a tweet, you’d actually see the content of that tweet while you were writing a reply. That’s gone now, replaced by a very nice new tweet-posting screen, with separate tabs for direct messages, replies, and standalone tweets. But the Iconfactory has compensated for the loss of reply context by creating a new “peek” button that slides the screen away, letting you view the original tweet. Even better, you can use the peek feature to quickly add items to the tweet you’re composing. If you tap on someone’s @account name, a hashtag, or even a URL, it will automatically be added to the tweet screen. From the user screen you can view information about a user, see their timeline, and follow or block them. A raft of new Twitterrific features lurk in the new Sources screen, accessible from the timeline by tapping the back button in the top-left corner of the toolbar. From this top-level screen you can access powerful new settings, several different timelines, see what people are talking about, and find what you’re looking for. 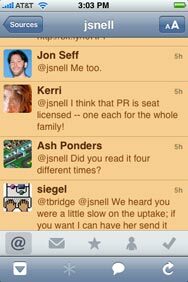 Support for multiple Twitter accounts is one of the biggest additions to this version of Twitterrific. I’ve been using Twitterrific 2.0 to check the @macworld Twitter account as well as my own personal account, aided by the fact that you can configure what displays in the timeline of each individual account. In the case of Macworld’s account, I’m not as concerned with following other people as I am with seeing tweets that mention Macworld—so I’ve configured Twitterrific to display only mentions in that timeline. On my personal account, I’ve set it to display everything—my friends’ tweets, my tweets, all my mentions, and even direct messages—in my timeline. The Sources screen also gives you access to Twitter’s powerful search engine, all from within the comforting Twitterrific app interface. If you Tap on Quick Search you’ll get a search query field that lets you specify what words, people, or even places to search for. If you perform a certain search often, you can save the search and go back to it whenever you want. The app comes with two searches saved by default: one looks for nearby tweets, based on your current location; the other is a demonstration search for Twitterrific itself. You can view trending Twitter topics at a glance via the Sources screen. At the bottom of the Sources screen is a list of the current top trends on Twitter—in other words, a list of what people are talking about right now. 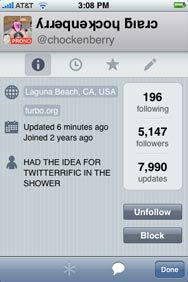 Tap on any of the phrases and Twitterrific will show you the latest tweets that mention the key phrase. Perched atop the Sources screen is a Settings button, and there have been some major additions to Twitterrific’s settings options. On the cosmetic front, you can choose from three different color schemes, one dark, one gray, and one light. You can choose which photo-sharing site to use for your photo tweets, among TwitPic, Yfrog, Posterous, and Twitgoo. Will a new version of an iPhone Twitter client change the world? Well, okay, maybe not. But Twitter and the iPhone are a perfect match of service and device. And just as Twitterrific 1.0 led the way on the App Store, Twitterrific 2.0 raises the bar in terms of being a delightful blend of functionality and usability.